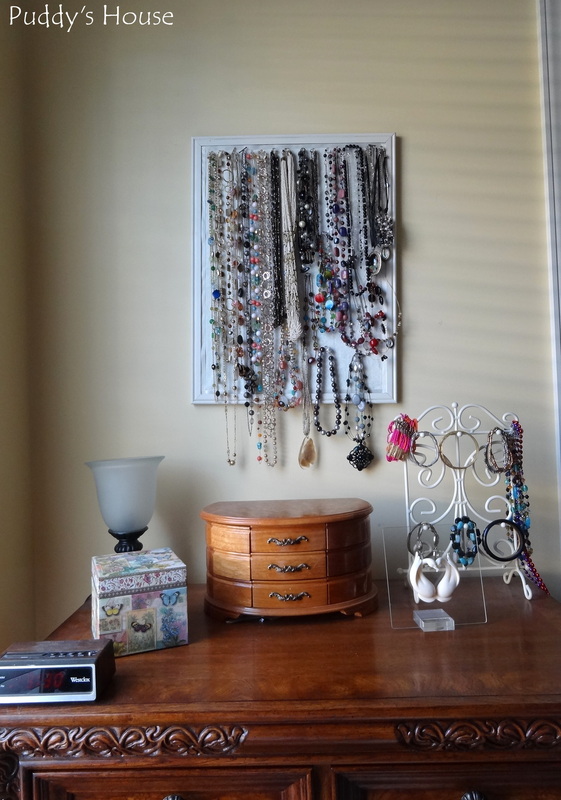 When I decided to move my jewelry into our closet, it freed up space on top of my nightstand as well as leaving me with any empty wall above it. I took advantage of the opportunity and used what I had in my supplies to give my nightstand a new look. I removed the jewelry box, jewelry rack, lamp, and the hanging necklace display. 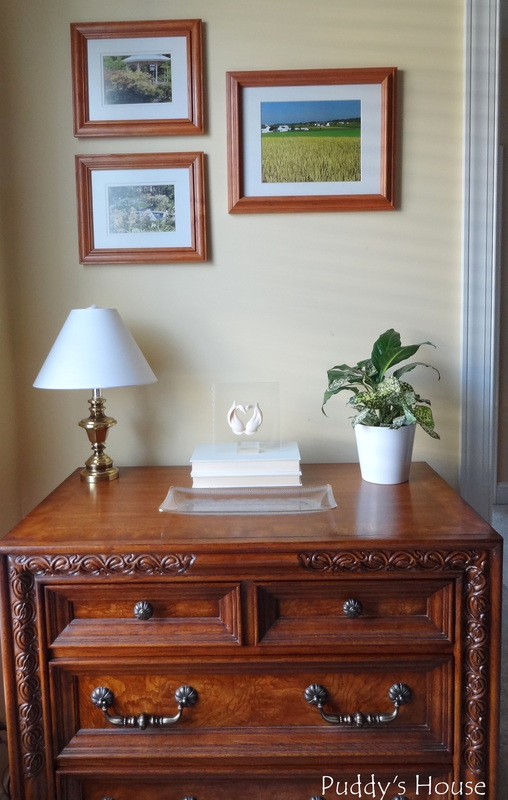 The box with the butterflies is where I store my cell phone charger and accessories, so it is functional for me, but it did not have to stay on my nightstand since I got a new phone I don’t have to charge it every night now. The alarm clock is necessary, since it goes off at 5am everyday! 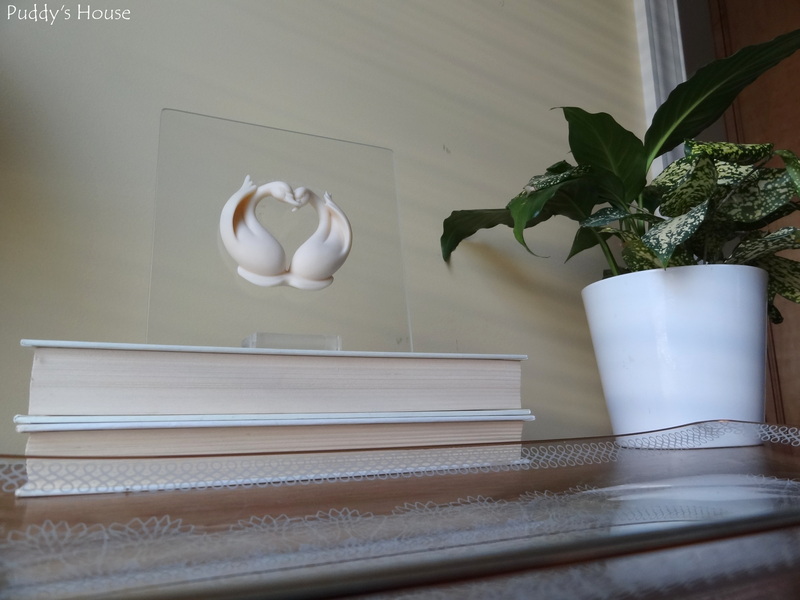 The other item with the 2 swans is very special, as it was a wedding gift from my co-workers. It says “two hearts beat as one,” and I just love it. I started the process by removing everything, and I ended up with a look I really like. 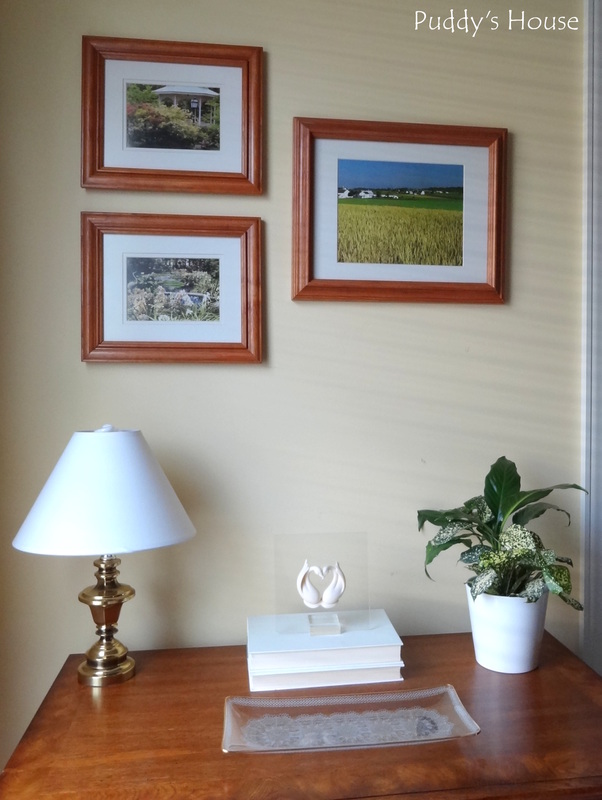 I’ll admit…I removed the alarm clock for the pictures, because it looks better without it, but it still does sit on the corner of my nightstand. I had the lamp in my décor supplies. I bought it at a yard sale, originally for the shade, but I never ended up using it anywhere. I added the plant for some color and life. The plant, including the pot, was on clearance at Lowe’s for $4. I picked it up when I went for the closet reorganization supplies. I wanted to keep the swans on he nightstand, but they seemed lost. Once I added the books, it seemed much more put together to me. And, then I added the glass tray to finish it off. 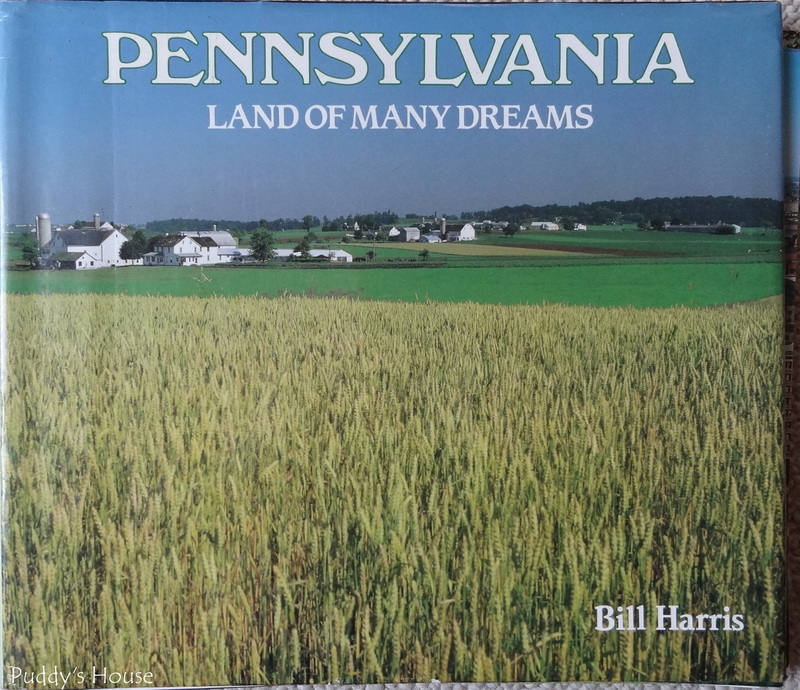 I had bought the book at a thrift store for $3. It was cheap because the pages were loose. I was glad they were loose because I only bought it to use the pictures from it. 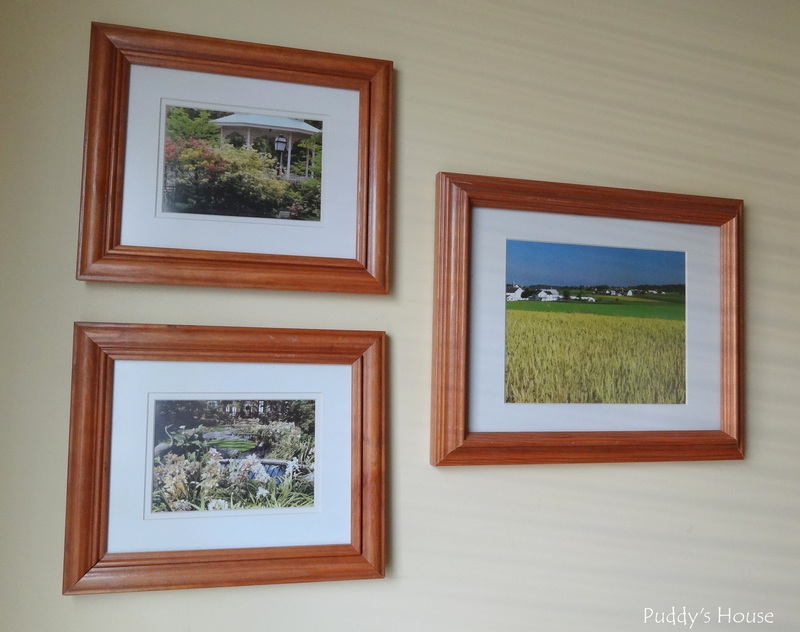 I pulled out local pictures from around the Lancaster area and put them in the frames. I think I would prefer the frames to be a different color, but I’m not sure what. What color frame would you use? I have some time to figure it out, because my preferred method for changing frames is to use spraypaint. And, its definitely not warm enough to set up my spraypaint shop out in the backyard right now! Overall, I’m really happy with the new look. And, Bob gave it his approval when he returned from his trip too. He thinks the frames should be a different color too, but we couldn’t decide on what. Any suggestions?